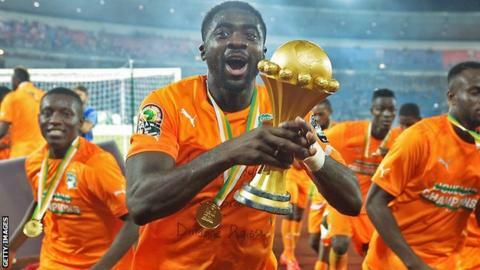 Liverpool defender Kolo Toure has confirmed his retirement from international football with Ivory Coast, a week after helping the Elephants to a Nations Cup triumph. The 33-year had indicated that the recent competition in Equatorial Guinea would be his last for his country. Toure, who made his debut against Rwanda in April 2000, played in all six matches as the Ivorians secured their second African title after a dramatic 9-8 penalty shootout win over Ghana in the final. Speaking to the local media in Abidjan, Toure said: "It is with great emotion that I inform you that it is time to say goodbye." Toure was part of Ivory Coast's 2006, 2010 and 2014 World Cup squads, but played in only one match at last summer's finals in Brazil, in the final group game against Greece. He also played in seven Africa Cup of Nations, losing two finals on penalties - to Egypt in 2006 and to Zambia in 2012. "Sometimes it plays in your mind, but with this incredible success you have to forget the past and enjoy the moment," he said. The veteran defender says he wants to bring an end to his 15-year international career by leaving the current Ivory Coast manager boss Herve Renard with a smile and not a major headache as he searches for his successor. "I am going to introduce my successor at the heart of the defence to you. He is tough. This is Ousmane Viera Diarrassouba, the new boss of the defence," Toure added. "He is my successor and will mentor young Eric Bailly and Wilfried Kanon. I rarely make a mistake in my choice, so Viera will perfectly replace me in the team." Having begun his career at ASEC Mimosas in Abidjan, Toure moved to Arsenal in 2002 and was part of the 'Invincibles' side who went through the whole season unbeaten in 2003/4. He was signed by Manchester City in 2009 before joining Liverpool on a free transfer last summer.